As one with high aspirations for the human race, in spite of its frequently embarrassing stumbles (wars, politics, persistent absence of flying cars, etc. ), the premise and final revelation of this tale saddened me somewhat. The Overlords come to Earth, halting millennia of strife and suffering amongst humanity, yet at a price--essentially the end of extraterrestrial human exploration. People become peaceful, happy, and largely sedentary (two of these three points I find, understanding the often determinedly irrational, domineering, and destructive human mind, nigh impossible without some kind of pharmacological intervention), and the explorer spirit is largely quashed with the aim of a different goal for humanity. If you're looking for rollicking sci-fi adventure, you're never going to find it with Clarke. He's a good, straightforward, but largely tension-free writer. This is not to say that his stories are not enjoyable or don't explore interesting avenues of thought, but you're probably never going to be rushing through a story to keep up with characters racing against a ticking clock. If anything, it will be to learn exactly what is going on (and maybe end up disappointed in the anticlimax... ahem... Rendezvous With Rama). In what might be a mild spoiler, I found myself disappointed in the resolution of the tale, which ended up being nigh spiritual, and a justification of many popular pseudosciences over the years (telekinesis, ESP, clairvoyance, etc.--all of which, I feel, are slightly less bunk than UFOs, ghosts, etc.). I understood it, and I thought Clarke's explanation was successful, but I'd prefer a science fiction novel have humanity succeed without transcending humanity. With that said, I didn't deduct any stars, since that's just a personal preference. 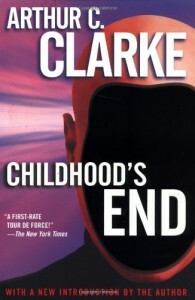 In Clarke's defense, he did provide a disclaimer at the beginning of the book which read "The beliefs expressed in this book are not those of the author." And why should you have to believe everything you write? That would be rather limiting, wouldn't it? I did deduct a star because it was, though much less than others, a hum-drum (yet concise and effective) telling of extraterrestrial contact. Still, that's what you get with Clarke, who is ever the even-keeled pragmatist, and it's a less tedious story than some others. Clarke isn't really a writer you get excited about (Yeah! An alien spaceship entered the solar system, then just kept going, because it was just using our sun to propel it onward! ), but you feel like you've broadened your mind a bit by having read him. He's a highbrow writer who manages to write probing stories without coming off as condescending or forcing his intellect down your throat by beating you over the head with his scientific knowledge or highly literate background. He writes without an overly heavy hand on subjects that could very easily bury the common reader. Perhaps that is part of Clarke's larger appeal. Please don't interpret this story as a condemnation of Arthur C. Clarke, I feel he's a very good writer of speculative fiction, but his approach is so pragmatic and without... urgency... that he doesn't quite generate the same amount of enthusiasm in me that, say, Isaac Asimov's Foundation series might. All in all, a good story. Go into it if you're interested in a look at how humanity may turn out for the better, or if you're up for a more grim interpretation, end.